Dramatic real life stories and inspiring fiction are combined in this collection of stories to lift the spirit and move the soul. 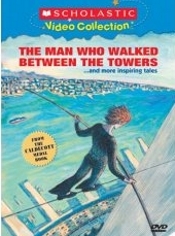 THE MAN WHO WALKED BETWEEN THE TOWERS (By Mordicai Gerstein, Narrated by Jake Gyllenhaal, Winner of the Andrew Carnegie Medal) Inspired by the true story of Philippe Petit and his daring 1974 high wire walk between the twin towers of the World Trade Center. SNOWFLAKE BENTLEY (By Jaqueline Briggs Martin, Narrated by Sean Astin, From the Caldecott Medal book) Ever since Willie Bentley was a young boy, he was fascinated with snowflakes. This is the true story of the world�s famous snowflake authority. MISS RUMPHIUS (By Barbara Cooney, Narrated by Claire Danes) Alice dreams of traveling to faraway places and making the world more beautiful. Inspired by a true story, Miss Rumphius shows us how we can all make the world a more beautiful place. THE POT THAT JUAN BUILT (By Nancy Andrews-Goebel, Narrated by Alfred Molina) Juan Quezada, one of Mexico�s most famous potters, used his creative gifts to transform his impoverished village of laborers into a thriving artists� community. As a teacher and parent, I'm always on the look-out for quality media. Scholastic videos have been a mainstay for years, and nearly all are wonderful. However, because of the quality and subject matter of the books this collection of shorts is based upon, this dvd is simply a must-have. I can read the books, watch the video, and discuss these stories with my young son, and then read, watch, and discuss these same stories with my 3rd and 4th grade students. A wide breadth and depth of subjects, emotions, concepts -- all of which lend themselves beautifully to use at home or at school. Very touching DVD. My children watch this DVD in my van and I didn't pick up on what the first story was about until the third time around. It's sad yet inspiring and the kids really like watching it. Two of the other stories are also taking from real life, and all focus on the human capacity to excel in his or her own way.